US, 1991, 98 minutes, Colour. Richard Pryor, Gene Wilder, Mercedes Ruehl, Vanessa Williams, Stephen Lang, Kevin Pollak. 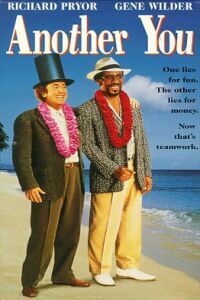 Another You sees the reteaming of Richard Pryor and Gene Wilder. It worked well in the 1977 Silver Streak, less so in 1981's Stir Crazy, popular at the box office with 1989's See No Evil, Hear No Evil. This film was not so successful. In fact it is a very strained comedy. This can be seen with the amount of mugging that the two stars go through. They are much more successful when they try to be more subtle. However, there are some compensations in Mercedes Ruehl (Fisher King, Married to the Mob) and Stephen Lang in supporting roles. All in all, forced humour. 1. Popular American comedy? The teaming of Richard Pryor and Gene Wilder? Past success? 2. The background of the American cities, the streets, homes? Factories? The songs and the musical score? 3. The title, truth, lies, the scam? 4. The quality and impact of the humour? Strained jokes, the comparison between the mugging of the cast and more subtle attempts at humour? Situations and dialogue? 5. Richard Pryor as Eddie, a man of the city, miming to the record (and it coming back later when he was invited to play at the nightclub, plays terribly and people think he is excellent)? On parole, rejecting the jobs, going to see George, trying to avoid him, a place to stay, George's dependence on him, getting the money and leaving? The Abe Fielding stunt? His bewildered response? Caught up in the atmosphere? The encounters with Elaine, the house? Al and George defending Eddie? Dibs and his insults - and George defending him? The puzzle? The revelation of the plot, his agreeing to participate, his greed? Coaxing George back to the house? The episodes as in the visit to the dentist? The plan for the killing of George, the bear, the tapes, the shooting? Setting up the funeral - his speech? His tricking Dibs? The first encounter with Gloria, meeting her again? The happy ending - and his partnership with George? 6. George, the compulsive telling of lies, in the institution, the group, his fears of going out? The Abraham Lincoln hat? Meeting Eddie, the money? Being abandoned? The Abe Fielding encounters, the bookmaker and the long story - and George defending Eddie? The couple in the restaurant, the staff at the restaurant? Meeting Elaine - and liking her? Her treatment of him? His return to the institution, the puzzle? His being coaxed back, the gifts? The possibilities with Elaine, the outing - and his yodelling to her and yodelling with her? The visit to the dentist and the documentation gathered? The plan for the hunt, the bear, his speech about not killing the bears, the funeral - and his emerging from the casket? The chase with Dibs, going into the vats, the marriage and the happy ending? 7. Dibs and his plan, manner, getting the actors to perform, his plot? His wanting George back, to kill him? Coaxing Eddie with the money? The tape for Eddie's killing of George? The funeral and his manner, the exposure, in the vat? 8. Elaine, as an actress, her style, with George - as Abe Fielding's wife? Attracted to him, his return, the gifts, the yodelling? Dibs and his plans, her not wanting him killed? Her reaction to his death - and his happy revival? 9. The members of the cast, Al and his spiel about bookmaking, the couple (and their being concerned about not rehearsing the scenes)? The waiters? The mix-ups, going to the funeral? 10. The group at the institution, the director and his idiosyncrasies, the old man declaiming, the man with the stammer, the man imitating Peter Falk and others? The rest of the group, welcoming George, going to the funeral? 11. The basic aspects of plot, deceit, the scam? Comedy? Comedy turns, mugging, subtlety?